Enugu— The Indigenous People of Biafra, IPOB, has banned further discussions on Nigerian unity anywhere in the South-East. IPOB made this known in its letter of apology to Igbo leaders for disrupting the General Assembly of the Eastern Consultative Assembly, ECA, at the Universal Hotel in Enugu last Tuesday. One of the leaders, Professor Elochukwu Amucheazi had his red cap, eyeglasses and his mobile phone taken away, although they were later returned to him. The meeting was convened to address the “Unresolved National Question,” as well as honour some leaders of the old Eastern Region for their contributions towards the development of the area. Two of the leaders, Chairman of Igbo Leaders of Thought, ILT, Prof. Ben Nwabueze and Chief Mbazulike Amechi were honoured while those who were honoured posthumously included Dr. Nnamdi Azikiwe, Dr. Sam Mbakwe, Chief (Mrs.) Margaret Ekpo and Philip Efiong. Popularly known as the Boy is Good, Amechi was a former member of the Zikist Movement and nationalist, who fought for the country’s independence along with the first President of Nigeria and Owelle of Onitsha, the late Dr. Nnamdi Azikiwe, Chief Obafemi Awolowo, Chief Eyo Ita, the Sardauna of Sokoto, Alhaji Ahmadu Bello, Chief Okotie Ebo, Chief Dennis Osadebey and Anthony Enahoro among others. Among those who also attended the occasion were the Deputy Leader of the ECA, Chief (Mrs.) Maria Okwor, Dr. Azikiwe’s widow, Prof. (Mrs) Uche Azikiwe, former National Secretary of Ohanaeze Ndigbo, Chief Nduka Eya (Egbevumbe); former Director- General of the National Orientation Agency, NOA, Prof. Amucheazi, Prof. Obasi Igwe, Prince Emeka Onyesoh, and the founder of Igbo Youth Movement and Secretary of ECA, Evangelist Elliot Ugochukwu-Uko. Others were Comrade Emma Zopmal, National Youth Leader of the Middle Belt Youth Forum; Mr. Aniekan Akamkpan and Douglas Warmate, both leaders from Akwa Ibom State and the Calabari Kingdom respectively. “Had Nnamdi Azikiwe been blessed with the same parochial mind-set as Sir Ahmadu Bello and Chief Obafemi Awolowo, then Nigeria would have evolved differently from this blood- sucking, corrupt and evil monstrosity that is now the laughing stock of the world. “We respect our honest elders like Prof. Nwabueze and Chief Amechi and will continue to do so. What happened was a protest against the one Nigeria project; not them. Nobody in tune with his or her senses will endorse the form of apartheid being visited on Biafrans by the current regime of Muhammadu Buhari. “What ordinary Biafrans are witnessing in Nigeria today is worse than what blacks experienced in South Africa that gave birth to the anti-apartheid movement the world over. We would like the world to view the outburst at Enugu as sign of what is to come in the near future. Our people and a majority of other people that wish to be referred to as Nigerians are all tired of the one Nigeria experiment and wish to go their separate ways. “IPOB, it must be said, has made it very clear; we are not interested in a restructured Nigeria, all we want and prepared to settle for is outright independence, which can only be ascertained via a referendum. “Anybody talking about restructuring is risking the anger of the people…Groups like Ohaneze Ndigbo which is favoured by Abuja were the same people, alongside the South-East governors, who invited the murderous Nigerian Army under the guise of Operation Python Dance II to kill and slaughter innocent men, women and children for daring to demand to be free from Nigeria. 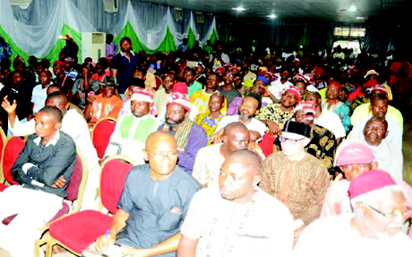 It specifically warned members of Ohanaeze Ndigbo to shelve their meeting on restructuring of Nigeria scheduled for March 16, in Enugu, pointing out that its members would not tolerate any discussion on Nigerian unity in Biafra land because of the level of discriminations against the easterners in the country over the years. However, signs that there would be trouble emerged when Chief Amechi began to speak by mentioning how, he along with other compatriots, fought for the country’s independence. “My children here in this gathering, I was among those who fought for Nigeria’s independence from British rule, but the constitution now being used was not the original constitution written by the founding fathers,” he said, as the people began to murmur openly. Amechi further went down memory lane by mentioning the different constitutional conferences held by the founding fathers to produce the 1963 Constitution which gave autonomy to the regions, adding that the said constitution had been bastardised by various northern military leaders who ruled the country for over 30 years to ensure northern hegemony. He noted that the current attack by herdsmen against the people of southern Kaduna, Benue, Taraba and Adamawa was a continuation of the Jihad launched against non-Muslim Nigerians by Usman Dan- Fodio. He said that the Zangon Kataf people in Kaduna, Jukuns in Taraba, the Kanuri in Borno and Tiv in Benue states could not be overrun by the jihadists hence, the herdsmen and Boko Haram terrorists were being encouraged by the government in power to continue from where the jihadists stopped. Amechi stressed that the Boko Haram attack on the people of Borno and Yobe states was because the Kanuri Empire was not conquered by the jihadists hence the on-going war to overrun and bring them under the Caliphate. “In Borno, they are killing the Kanuri who defeated the jihadists from the Uthman Dan Fodio Empire. They are also killing people of Zangon Kataf in Kaduna, Tivs in Benue, as well as natives of Taraba- the Jukuns. “In the southern part of Nigeria, it is only Governor Ayo Fayose that is fighting for the people. The governors of the South-East are like jelly fishes. They are hiding their heads in the sand like ostriches…,” he said. Amechi further said that the 1999 Constitution was an illegal document and the source of all the problems in Nigeria and therefore insisted that a new constitution was the only way to salvage Nigeria now. According to him, those who were resisting the restructuring of Nigeria under a new constitution were only making it difficult for the country to survive, adding that the only option left to keep Nigeria united was to restructure it into regions. Nwabueze stressed that the continuous delay in reconstructing Nigeria would not augur well for nation, pointing out that the country needed to resolve the national question before the next elections. In his own speech, the Founder of Igbo Youth Movement, IYM, Evangelist Ugochukwu-Uko, said that the people were angry with Nigeria. “They are tired of Nigeria. They don’t want to identify with Nigeria anymore. Nigeria has continuously rejected them. They too have rejected Nigeria. The people advising the authorities to use military force and quell the agitation are only deceiving Abuja. Abuja must engage the angry youths,” he added. Other speakers also pleaded for the restructuring of Nigeria before next year’s election. The post How IPOB mesmerized and humiliated Igbo leaders in Enugu appeared first on Vanguard News.